Russia is celebrating May Day at the height of the world economic crisis. Signs are it is precisely the crisis that makes today’s holiday a true symbol of working people cohesion. Today’s spring and labour holiday, which is above all International Working People’s Solidarity Day, has been celebrated in Russia since 1890, that is for the 119th time. Many-thousand strong manifestations are held in the cities in the Russian Far East. 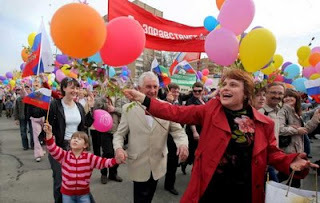 Processions by Moscow trade unions will be led by their leaders and United Russia functionaries to set up a cry for work, wages and dignified life. Something else we don't celebrate here. We create our own "Labor Day" on which almost everyone has to work. May day had too many association with the various workers strikes and revolutionary aspirations. The labor associations in Europe do have links to America, because the Second International of the European Socialists and Labor Parties in Europe decided to honor the American Haymarket General strike of American common laborers, artisans,merchants and immigrants in Chicago, in the year 1886. There were riots etc, and eventually the police killed a dozen people and 7 anarchists were tried and hanged. In order to counter the Soviet Unions use of Labor Day to honor workers, during the Cold War, the United States Congress designated May 1st as "Loyalty Day" and the United States is one of the few nations where May Day is not celebrated in the same way as it in Europe and other areas.